Henry Ford was the founder of Ford Motor Company, which played an important role in the industrialization of America. An early car from the Ford Motor Company. Henry Ford was an industrialist in America who founded the Ford Motor Company. His company developed and manufactured affordable automobiles which revolutionized the transportation industry in America. He is credited for mass production of cheap products coupled with better pay for the workers. His commitment to lowering the cost systematically resulted in several business innovations that led to the growth of the Ford Motor Company in North America and major towns of the other continents. Henry Ford was born in 1863 in Michigan. His father came from County Cork while his mother was born in Michigan by a Belgium immigrant. Henry Ford was the first born in a family of five children. At the age of 13, his father gifted him a pocket watch which he promptly dismantled and reassembled perfectly. By the age of 15, his friends and neighbors had taken note of his ability to fix things and would often request him to fix their timepieces gaining a reputation of watch repair. When his mother died in 1876, he became devastated and unsettled. Unsatisfied with farm work, he left home in 1879 to take part in apprentice machinist in Detroit. He would acquire skills in operating and repairing steam engines. He also studied bookkeeping. In 1891, Henry Ford got employed as an engineer with the Edison Illuminating Company. Three years later his talent was noticed and he was promoted to the position of Chief Engineer. 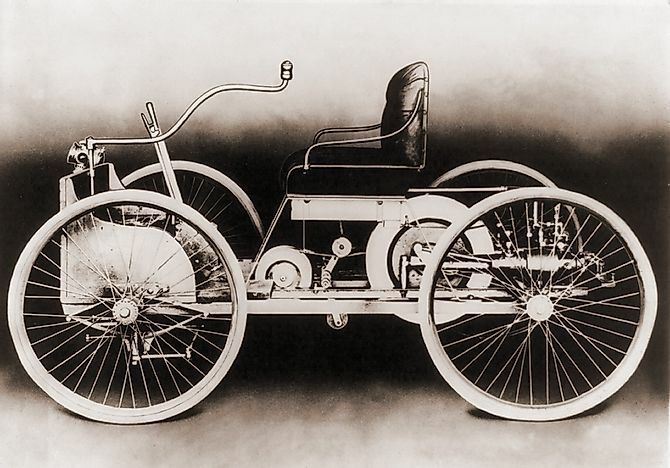 He also devoted his time and resources to personal experiments on gasoline engines, and in 1896 he completed the Ford Quadricycle. During the same year, he attended an executive meeting where he presented his work to Thomas Edison who encouraged him to build a better model. He completed the second model in 1898. Ford resigned from the Edison Company and immediately founded the Detroit Automobile Company in 1899. However, the company was dissolved in 1901. Ford started the Ford Motor Company in 1903. He invented the model T in 1908 and for the years that followed the company recorded 100% gains. By 1918, more than half of the cars in the US were model T.
Henry Ford is credited with revolutionizing the American’s automobile assembly-line of production. He converted automobile from the expensive model to the cheap model T automobiles that several middle-class Americans could afford. He shared the company’s profit with the workers and ensured that they lived a decent life. Ford was an ardent pacifist who was opposed to the World War I and even sponsored a peace ship to Europe. In 1936, he, together with his family started the Ford Foundation which offers grants for research and education. In 1914, he published an anti-smoking book which documented the side effects of cigarette smoking. While Henry Ford was perhaps one of the most successful in the history of America, his life was not without challenges and controversies. He was adamant about the labor union. The rising discomfort and mistreatment of some of the workers led violence in the 1930s and 1940s. In 1941, the Ford Motor Company workers went on strike forcing Ford to agree to the workers’ demands. Ford faced health challenges including stroke in the late 1930s rendering him unable to provide leadership to the company. Most of the company decisions were made on his behalf and without his consent most of the time. Ford was also documented as having racist views, particularly involving anti-semitism.